This open plan living and dining area in a contemporary property retained a sense of space and light punctuated with vibrant turquoise colour in accessories and richly coloured wood. 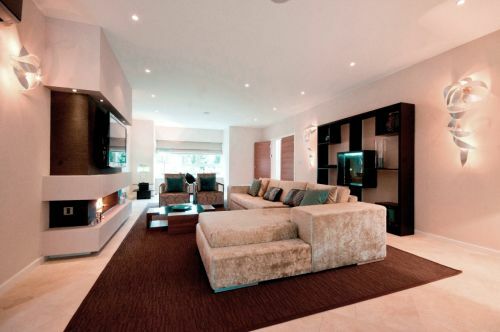 Bespoke wall unit incorporated a coloured crushed glass feature tile with in-built light. Made to order metal wall lights added an option of cosy lighting in the evenings.